For all of those history buffs who are tired of visiting museums to see artifacts, there are actual shipwreck sites available to visit. Apparently there are almost three million shipwrecks that haven’t been discovered worldwide. Some historians believe that some of those lost ships could be as old as thousands of years. For those who are unable to visit the shipwrecks personally, there is a website that takes the viewers through virtual tours of almost 150,000 ships that have been found and documented. A majority of those ships are protected under UNESCO. 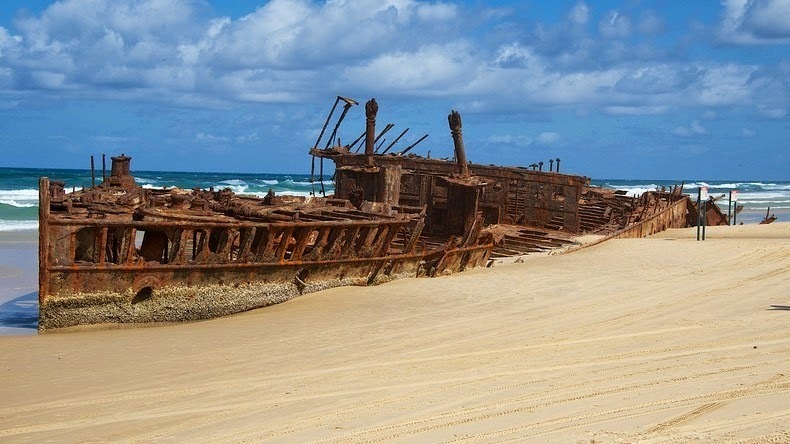 The shipwrecks that have been found have been abandoned on beaches or submerged – some looking better than others. The most recent shipwreck is Costa Concordia which foundered in the waters of Isola del Giglio off the west coast of Italy in January, 2012. Many tourists have traveled from around the world to see it before it is salvaged or removed, garnering an interest in other visible wrecks. This was a cruise ship built in 1974 that took frequent trips to the Antarctic so that the passengers could view the ice flow movements. Although the ship was built rugged for the chilly waters and had a tough shell in case of small impacts, the people on the ship the day it went down did not expect a large rock to puncture the side of it. The impact happened on April 30, 2000 in the Solomon Islands. All of the passengers survived the impact and were carried off by a ferry. Once all of the passengers were safe on the ferry, the captain steered the ship onto a nearby bay to save it from sinking. Sadly, when a salvage crew finally came to the ship, it had already been ransacked. It still remains in the same bay today. The ship was built in the early 1950s under the name of City of York in Newcastle, England. This too was a cruise ship; it launched in London in November 1953 and was used until 1971 when it was sold. After the sale it was renamed Mediterranean Sky. The last time the ship sailed was in August of 1996 when it was making a trip from Brindisi to Patras. It didn’t get too far before being confiscated due to the company’s financial issues. 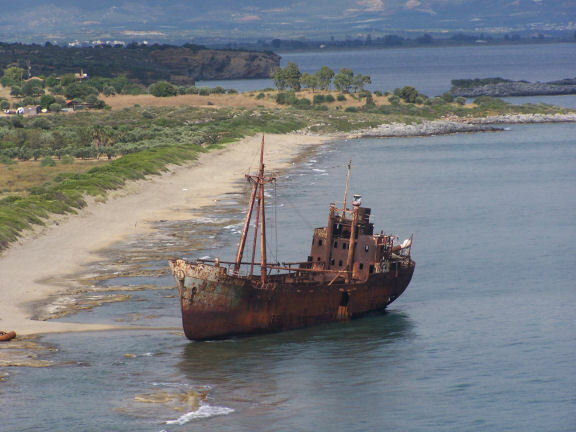 Two years after the ship was taken away, it was towed to Eleusus Gulf in Greece where it was abandoned. In late 2002, the ship started to spring a leak and take in water. Eventually it started to tip, so it was towed again to shallow water and grounded. 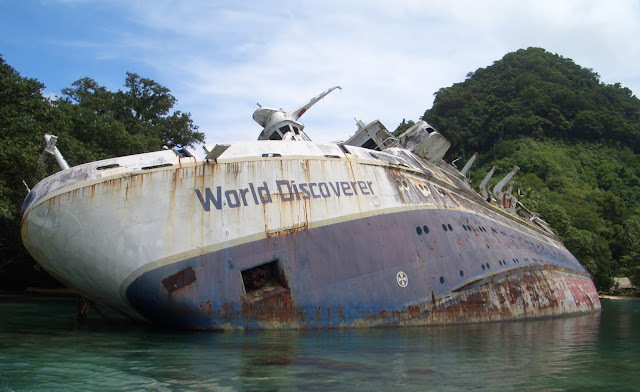 In January 2003, the ship ended up tipping on its side and that is how it rests today. This ship was originally used as a Greek sugar-carrying vessel; it sank in River Clyde in Scotland in 1974. A BP tanker collided with the ship when the BP tanker was hit by a gale. What is most unfortunate is that the Capytannis didn’t suffer any immediate damage from the collision; however, its anchor put a hole in the side where it allowed water to get through. The captain tried to bring the ship into shallower waters and managed to put it on a sandbank, where it held. The ship sank onto its side during the night and has been that way ever since. Sadly, the metal was worth money so the ship has been looted – only the frame of the one side remains. This ship was an ocean liner that was built in 1940. It was used for more than 50 years and eventually was sold in 1993. 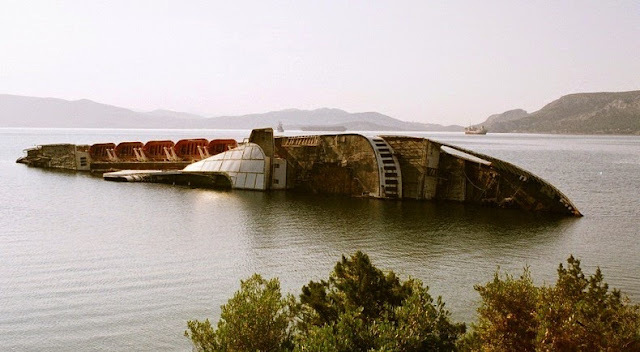 Originally it was supposed to be made into a five-star hotel ship in Phuket, Thailand. The ship was renamed American Star, however it was never used under the name. The ship was towed out of Greece and toward the Atlantic to be refitted for the new renovations, however, precisely 100 days later the ship with its tugboat encountered a thunderstorm. The crew among the large ship had to be rescued by helicopter after unsuccessfully trying to rope in emergency tow lines. On January 18th of that year, the ship ended up running aground on the coast of Fuerteventura, Canary Islands. Within two days in the Canary Islands, the surf split the ship in two. Immediately after that the stern collapsed, and that sank in 1996. 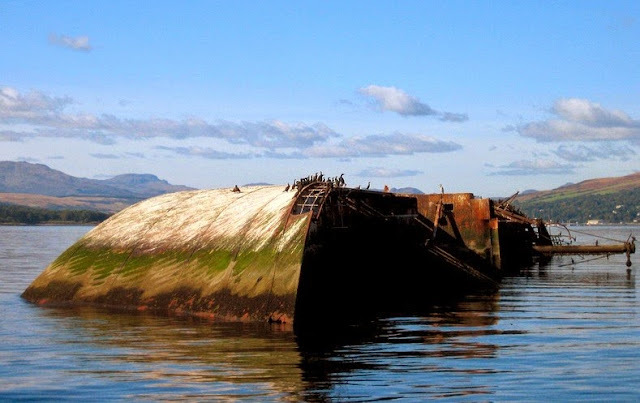 In November 2005, the hull started to break up, and by 2007 the remaining parts of the ship had all fallen into the sea. Sadly, due to the large waves and currents, bits and pieces of the remainder of the ship often break off and flow free, perhaps lost for good. 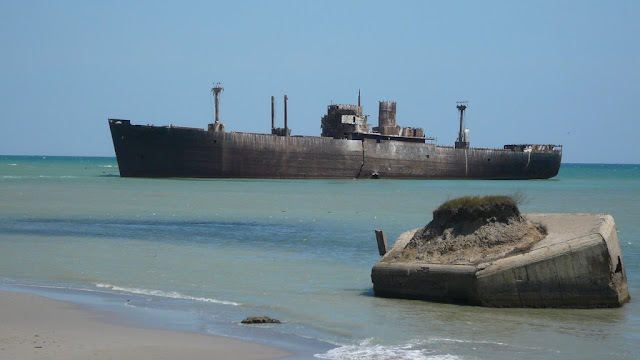 As of March 2013, the ship can be viewed only at low tide. This small ship was built in 1950 and has been stranded on the beach of Valtaki of Laconia, Greece since December 23, 1981. Historians still do not know the exact story as to how the ship got there on the beach. Some believe it was a ship used to smuggle items, especially cigarettes, between Turkey and Italy. It was seized by port authorities of Gythio and was to be dragged by sea to Valtaki, where it would be set on fire to destroy all evidence of smuggling. There is a book written by a Coast Guard chief who claimed the ship had to dock at the Gythio port on December 4, 1980 during an emergency because the captain needed hospitalization due to an illness. According to the author, engine and insurance issues caused the abandonment of the ship; it was left at the port by the captain and crew and remained there until 1981. 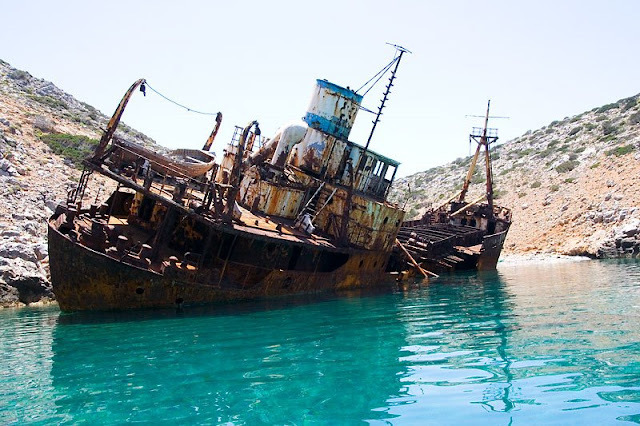 This was a commercial ship that was driven toward the town of Katapola in Amorgos, Greece by pirates in 1979. The pirates were trying to go from Cyprus toward Greece, but after several attempts trying to pull out of the gulf, they abandoned the ship. It is still known today as the Amargos Island’s most popular landmark. 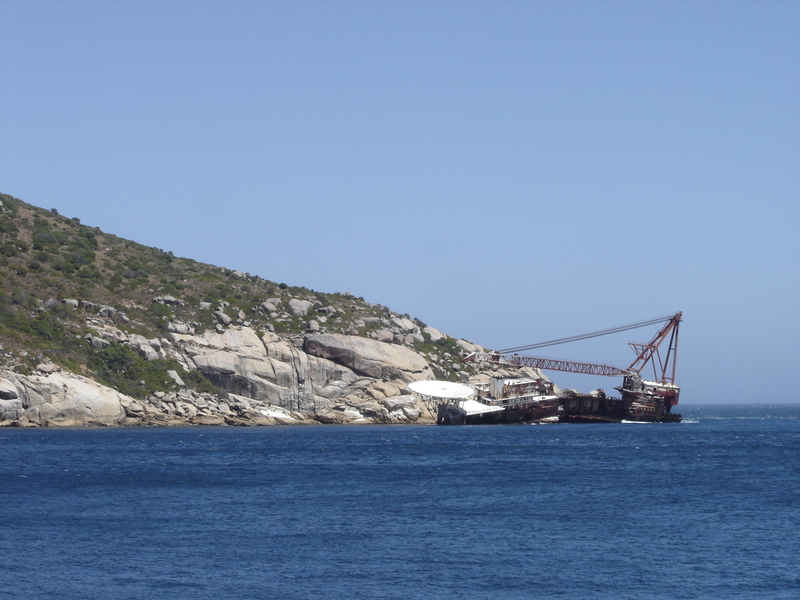 This is a French barge that was abandoned at Maori Bay in South Africa as it was being towed by a Russian tugboat on June 26, 1994. 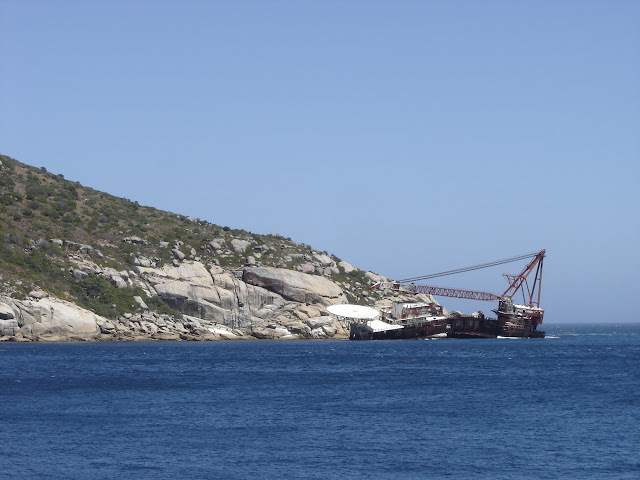 This ship was known as the biggest floating crane in Africa, but its towing lines broke and the vessel hit rocks during a storm. Since barges need to be towed and have no engines, it was hard to recover the barge. There have been several tow attempts after the storm, but all have been unsuccessful. The company saw this barge as a total loss and was not able to recover anything from the wreck. This gunboat was bought by the South Australian government in 1884 in the hope that it could defend the coastline against the possible attacks during the Russian scare of the 1870s. The ship came to Australia in September 1884 and served in three wars: the Boxer Rebellion, World War I, and World War II. In July 1943, the ship was bought by the US Army, but it was damaged in a collision with a tug boat and abandoned in New Guinea. The only thing visible of the ship today is the rusted frame that lies buried in the water. This ship was used as a merchant ship and was actually made by the same shipyard as the Titanic. Launched on May 28, 1942 with the original name of Empire Strength, it was then changed to Saxon Star, Redbrook, and eventually Evangelia. Sailing on a foggy day, the ship strayed too close to the shoreline and became grounded near Costinesti. Some historians believe that the ship was deliberately grounded to collect on its insurance. The reason behind this theory? It was said that although the weather was foggy the sea was calm, and everything was working order on the ship that day. 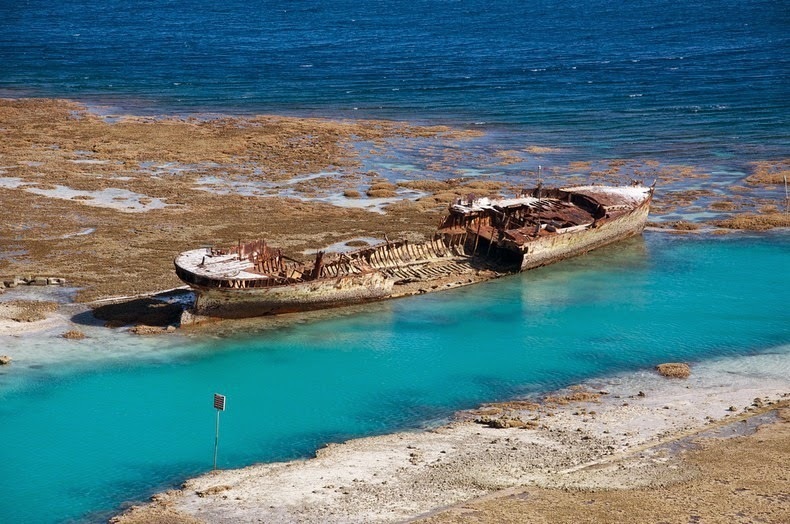 This is the most famous shipwreck in the Fraser Islands in Australia. Maheno was built in 1905 and was one of the first turbine-driven steamers. The ship ran regular routes between Sydney and Auckland until it was used as a hospital ship in Europe in World War I. In 1935 the ship and one similar to it were sold to Japan for scrap metal. While being towed, the ship hit a cyclone and the towline snapped. The tow crew attempted to reattach the ship, but this did not work and the Maheno with its eight-man crew drifted away to be found three days later on Fraser Island. Thankfully, the crew members survived and were camped on the shore where the ship landed. 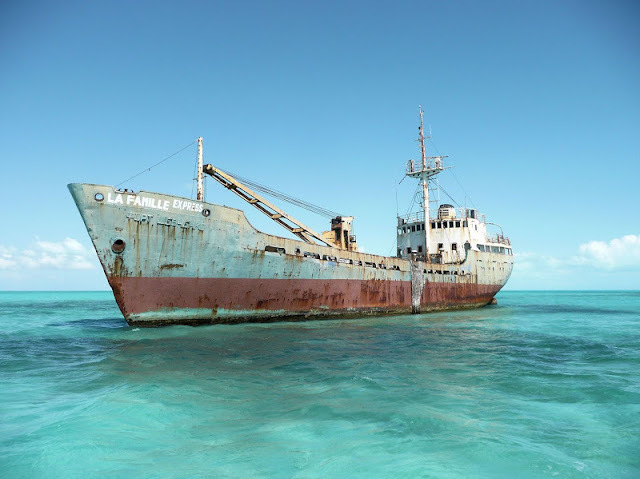 After finding out that the ship would not sail again, the owners put it up for sale as is. However, the ship found no buyers and stayed on the island. It is now a rusted shell of what it used to be. This ship was a Spanish freighter which carried numerous gifts and treasures from the Spanish government of Francisco Franco. The gifts were to be given to those who supported him during Spain’s economic crisis. Some of the freighted items were food, cars, and medicine. On September 1, 1968 the ship passed Cape Verde islands on its way to Brazil and Argentina. When it went aground there were many attempts at trying to get it unstuck, but it was eventually abandoned. Franco made sure all of the cargo was taken off before officially abandoning it. 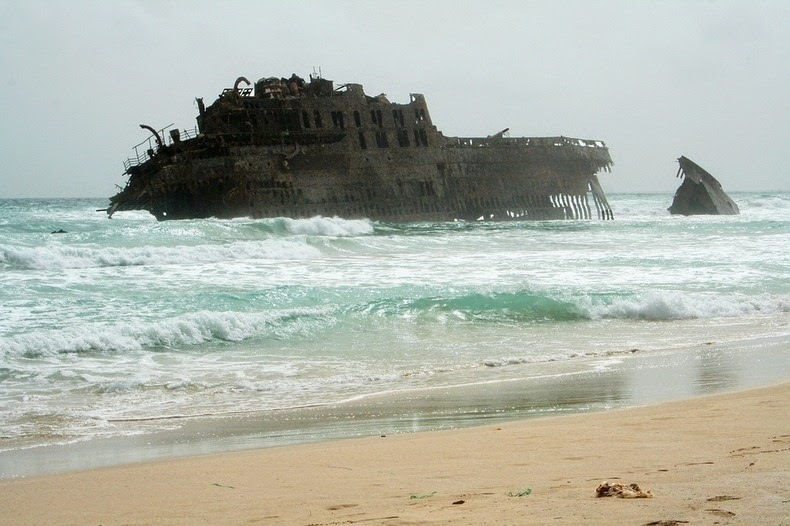 The ship is another tourist attraction in Boa Vista and Cape Verde.